Nutrient and sediment loading from surface runoff, excessive buildup of organic matter from leaves, grass clippings, fish wastes, dead algae and aquatic vegetation, can lead to poor water quality, algae blooms, muck buildup, odor problems and an unbalanced pond ecosystem. Natural bacteria and enzymes each play a very different role in your pond or lake. Bacteria and Enzyme products help remedy these problems. Understanding how each item affects your pond will help make selecting the right products easier. Get the Muck Outta Here consists of all -natural bacterial pellets that remove up to 70% of pond sludge. They are a slow release pellets that sink to the bottom of the pond into the muck and reduce it by stimulating naturally occurring bacteria and adding sludge eating cultures. This product works best when the water reaches at least 60º noting that the warmer the water the faster the bacteria reproduce and digest sludge. It can be used in a traditional dose or a super dose for ponds that need to reduce large amounts of muck. 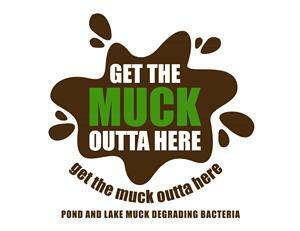 Get the Muck Outta Here is sold in a 10lb and 30lb pail and should be used monthly based on the depth of muck. The Pond and Lake Connection feels that this product will be a great tool for our customers where dredging is needed but the cost of the dredging project is quite large. Aqua-Librium is an all natural beneficial bacteria. This product is designed to balance ponds and lakes by lowering ammonia, removing nutrients and controlling odors. It is a unique formula of select biological species, 23 essential vitamins, biostimulants and fast-acting enzymes that are essential to healthy and robust microbiological development. 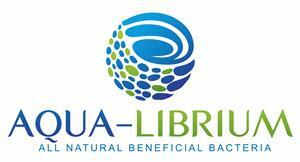 Aqua-Librium is environmentally friendly as well as irrigation and swim safe. For best results this product should applied when the water temperature is between 60ºand 80º. The packets should be distributed around the edge of the pond. It is also recommended to use Aqua-Librium along with an aeration system. 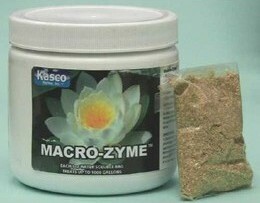 Macro-Zyme ™ is available in easy-to-use water-soluble bags or 25 Lbs. bulk boxes. Just toss the water soluble bags or apply the bulk product at the recommended rates. Macro-Zyme ™ has a shelf life of 2 years! Macro-Zyme ™ contains no dangerous chemicals or harmful bacteria and is safe for wildlife. These bacteria will flourish with the addition of aeration. 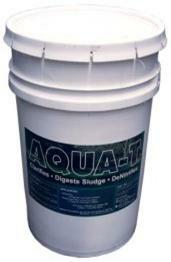 Aqua-T pond bacteria uses a revolutionary combination of specific strains of bacteria and bacterial enzymes that reduce sludge, control foul odors, and digest the excess nutrients which may cause problematic algae growth. These naturally occurring soil and water bacteria work to clean the entire water column and sludge layer by digesting organic wastes and contaminants. Aqua-T is environmentally friendly. It is NOT an algaecide or pesticide, so it does not require a permit or license to apply it.